At 20:34 on July 23, the train D301 crashed with the train D3115 on an elevated bridge between Yongjia and Wenzhou, Zhenjiang province. Carriages 1 through 4 on D301 and carriages 15 and 16 on D3115 were derailed. According to the reports, there were 39 deaths and 192 injuries. The Communication University of China's Internet (Public-Opinion/Word-of-Mouth) Research Institute used I-Catch to analyze Internet opinions on a sample of 100 typical websites. As of 10am, July 28, 2010, there were 17,595 reports directly related to the Wenzhou train crash with 468 websites carrying them. These news reports had 2,845,626 comments. There were also 92,796 BBS posts, 53,494 blog posts and 9,616,248 microblog posts. Compared to the Guo Meimei Baby affair, the Wenzhou train crash drew more public attention, being at least 10% higher in the trending indices on a daily basis. Internationally, the foreign media also carried far more reports than the Guo Meimei Baby affair. 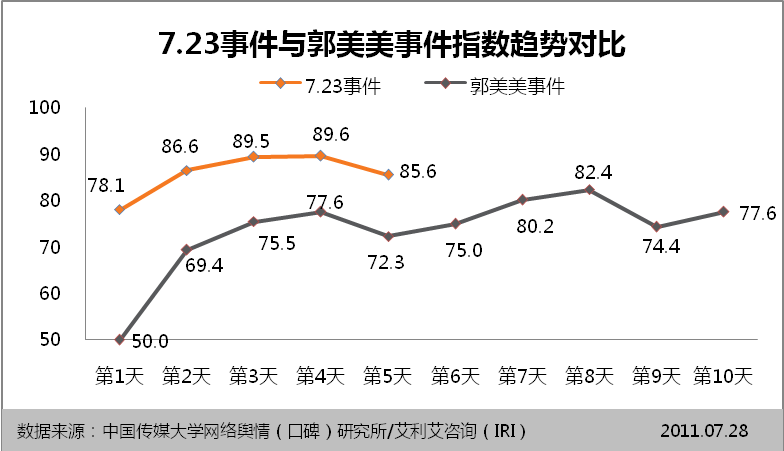 According to the analysis by the IRI consultancy, the Wenzhou train crash led to massive casualties in a case that involves huge political and economic interests, and that is why the foreign media paid great attention and hyped up this incident. At this time, negative opinions are overwhelming positive opinions on the Internet. The Internet users have questions about the cause of the crash, the rescue effort, the casualty figures, the follow-up processes, the disposition of the train wreckage, the safety of high-speed trains in China, the press conference held by the Ministry of Railways and the behavior of the mainstream media. This covers eight areas and 41 specific questions. On the morning of July 28, Premier Wen Jiabao traveled to Wenzhou to visit the train crash victims and responded to press questions in a media conference. Thereafter, the Internet users became more relaxed and steady. Here are the specific issues encountered so far . (1) The cause(s) of the train crash. The major train crash on the Yongwen line on July 23 was the result of one moving train D301 crashing into a stationary train D3115 from behind. This is an elementary mistake. Previously, the Ministry of Railways has always shown great confidence about its technology and the media have lauded the Chinese technology that was designed to prevent such train crashes. With so much advanced technology in place, the Ministry claimed that this crash occurred because of a lightning strike. Internet users found this to be unconvincing. Numerous doubts, speculations and rumors emerged. 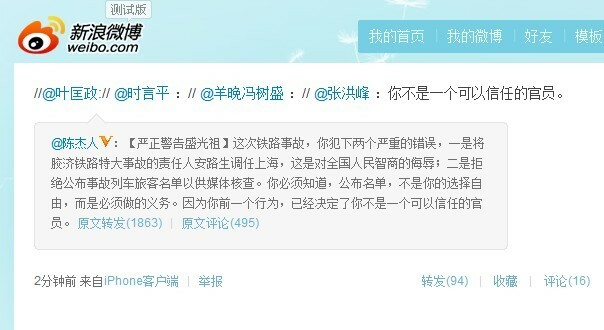 As of this time, there are 10,400 news reports, 394,999 BBS posts and 579,981 microblog posts on the cause of the Wenzhou train crash. Question 1: Why was the time of the crash revised? On July 24, the Xinhua press copy said that the crash took place at 20:27, which is 7 minutes earlier than the 20:34 originally reported by the China News Agency on the night of July 23. The earliest microblog post seemed to indicate that the crash had not yet occurred at 20:27. Therefore Internet users wondered if the revised time was a cover-up effort. Question 2: How can a lightning bolt caused the various layers of preventative systems to fail? There were many technical analyses of the technology to prevent one train from chasing down and crashing into another one. Internet users do not believe that an act of nature could cause such a train crash. Internet users wondered if the Ministry of Railways's "lightning strike theory" was an attempt to cover up human errors. Question 3: Why did the surviving driver of train D3115 not appear in public to explain what happened? The driver of train D3115 is a key witness. He has not appeared in public to explain how the crash happened. Internet users suspect that the Ministry of Railways is restricting access to this driver in order to cover up the truth and/or use him as a scapegoat. According to one media report, a surviving passenger heard the driver talking to himself afterwards about being instructed by the dispatcher to stop on the tracks. Question 4: According to the train schedule, this crash occurred when a train scheduled to depart earlier hit a train scheduled to depart later from behind. How is this possible? According to the official time table, D3115 should be behind D301 in the railway section from Taizhou to Wenzhou. But the crash occurred when D301 caught up and crashed into D3115. Internet users think that this showed that there was a problem with the dispatchers. Question 5: Why did the train dispatch system fail? Even if a lightning bolt incapacitated the signal system, the dispatchers should be able to use many other means to determine the conditions of the trains as well as communicate with the train engineer/drivers. Internet users wondered why the fault-tolerant train dispatch system should fail so completely. (2) The effectiveness of the rescue effort. Five hours after the train crash, the relevant departments announced that there were no signs of life left and stopped the rescue effort. More than ten hours after the rescue effort was stopped, the "miracle girl" Xiang Weiyi was found. Internet users completely lost confidence in the rescue effort. 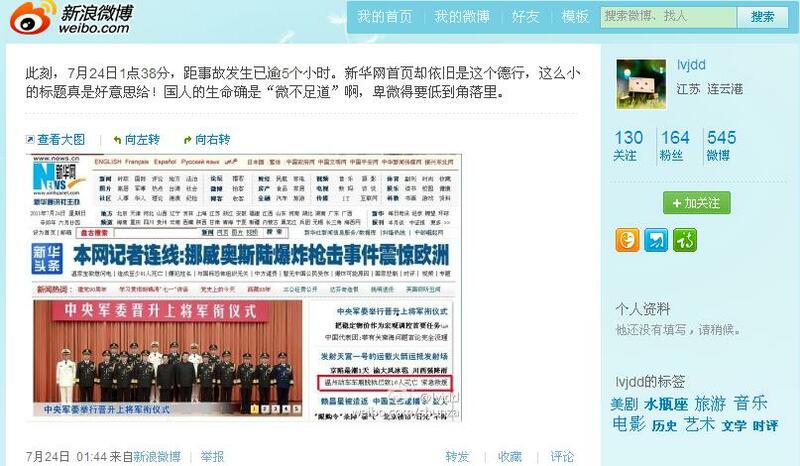 At this time, there are 13,000 news reports, 88,695 BBS posts and 496,997 microblog posts on the rescue effort after the Wenzhou train crash. Question 1: Why was the rescue effort stopped after 5 hours? Even though many of the bodies of the victims were still trapped inside the compartments, the rescue effort was stopped after 5 hours and the train compartments transferred to the ground. Comparing against the carefulness, meticulousness and humanitarianism of similar rescue efforts elsewhere around the world, Internet users were angry that human lives were being unvalued and disrespected here because of the order to clear out the railway track for trains to run again. Question 2: Why was the young girl Yiyi found after it was declared that there was no sign of life? More than 10 hours after it was declared that there was no sign of life, the SWAT police officers found young Xiang Weiyi. The Ministry of Railways spokesperson called it a "miracle." Internet users were not satisfied with the "miracle" talk because they believed that the rescue effort was crude and sloppy, and more lives could have been saved. Question 3: Was the rescue effort too crude, to the point that some of the bodies were mutilated? Yang Feng lost five relatives in the Wenzhou train crash. His pregnant wife was practically unidentifiable and his aunt's head was half missing, clearly caused by an excavator machine. Internet users were angered by these rough methods and they believed that survivors of the initial crash were killed during the rescue effort. Rumor #1: The media interviewed the SWAT police officer who said that he was ordered to abandon the rescue effort. The SWAT police captain who rescued young Yiyi said during an interview: "In the afternoon, I received the instruction that the train compartment would be raised by a crane and lowered down on the ground under the bridge. I disagreed. What if there were signs of life? How can I face the families? I insisted on processing the train compartment right there on the track." The Internet users praised this SWAT police captain for disobeying order and continuing the rescue effort on the spot. They demanded that the government official who issued the instruction be identified. Also, there was an Internet rumor that this SWAT police captain was sanctioned because his comment made the government look bad. Rumor #2: A body fell out of a train carriage which was being lowered down to the ground. On the video of the train compartment being lowered, Internet users said that they can hear someone screaming and a corpse (or living person) falling out of the train compartment. The media have verified that a physical part of the train had fallen off. (3) The number of casualties and the follow-up process. The two trains were almost fully occupied at the time of the incident. When the four compartments fell of the bridge onto the ground, the action must have been horrendous. The official casualty figures were far less than public anticipation. This caused Internet users to be suspicious about the statistics. They were also concerned about the follow-up processes (such as the compensation given to the families of the victims). At this time, there are 10,970 news reports, 909,086 BBS posts and 972,148 microblog posts on these aspects. Question 1: How many people actually died? Each train compartment can carry 100 passengers. Four almost fully occupied train compartments fell to the ground. But the official statistics were 39 deaths and 192 persons injured. Internet users wondered how the several hundred other passengers could escape unscathed. Question 2: Why can't the passenger list not be published when a real-name verification system was used for ticket purchase? There is a strict real-name verification system used for train ticket purchase. Therefore, the Ministry of Railways is fully capable of producing the passenger lists for the public to consult. Since the lists were not published, Internet users became more suspicious about the official accounts. Question 3: The maximum 200,000 yuan train passenger insurance has been the same for the past 20 years? According to the 1992 version of the <Regulations on the compulsory accident insurance for railway passengers>, the maximum amount payable to the travelers is 20,000 yuan. Within the price of the train ticket, 2% is used to purchase this insurance. But since train ticket prices have been rising over the past 20 years, how can the maximum payout still be the same 20,000 yuan. Question 4: It is chilling to see that bonuses were being paid the families which sign the agreement quickly. According to media reports, the Ministry of Railways was offering several tens of thousands yuan under certain circumstances to the families which sign the compensation agreement early on. Another news report said that the payment will be made upon receipt of a cremation certificate. These allegations are chilling. Detail #1: Two students from the Communication University of China (Lu Haitian and Zhu Ping), the D301 train engineer/driver Pan Yiheng, the deceased parents of the young survivor Yiyi and Yang Feng who lost five members of his family caused sorrow and anger among Internet users. Detail #2: Yang Feng who lost five members of his family is no longer talking. The media reported that he was threatened by senior Ministry of Railroads officials with the loss of more family members. Internet users are incensed. Detail #3: More than twenty family members of the deceased passengers demonstrated at the Wenzhou South Train Station to demand the truth be revealed. Internet users strongly support their effort and called for the truth to be revealed. Rumor #1: The City Party Secretary loses his job if the number of deaths exceed 35. There was a "theory about the maximum limit of 35 deaths." 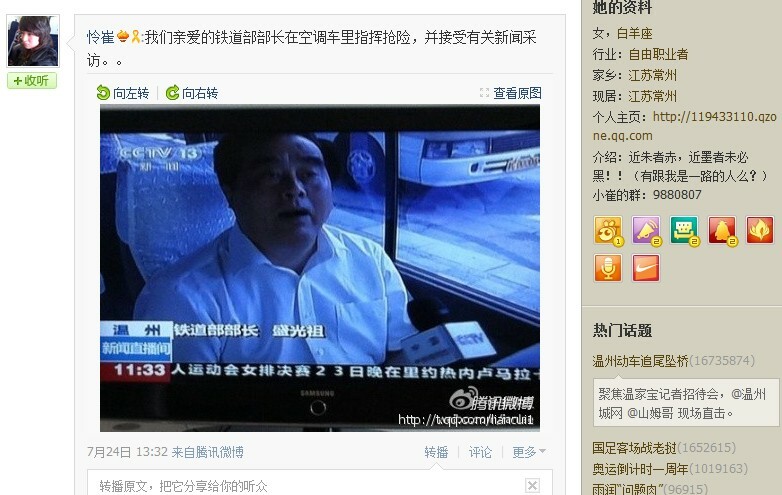 It is alleged that the Wenzhou City Party Secretary will lose his job if 36 or more people died. Therefore, as soon as the train crash took place, it was pre-determined that the number of the deaths shall not be greater than 35. 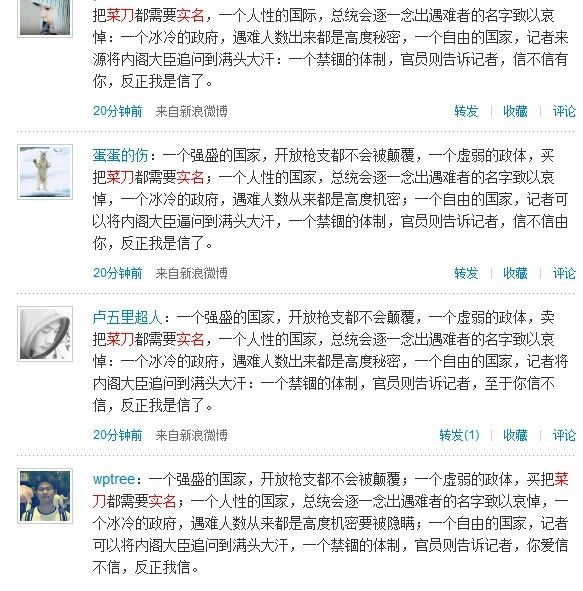 The microblog post also lists the number of deaths in major incidents in China between 1993 and 2011. By "coincidence," the number of deaths was always 35. This allegation confirmed to Internet users that the true number of deaths was being concealed because government officials were trying to protect their jobs. After a train crash, the wreckage should be the best evidence from which to determine the cause and to learn from for the future. As such, the wreckage should be preserved. But the relevant departments were carelessly crude about the handling of the wreckage. This caused Internet uses to suspect that the government was trying to destroy the evidence and cover up the true damage. At this time, there are 7,580 news reports, 63,597 BBS posts and 828,947 microblogs on the handling of the wreckage from the Wenzhou train crash. Question 1: Why was the D301 engine put into a ditch? The Ministry of Railroads said that it was necessary to do so in order to clear the way for he heavy equipment (such as cranes) to move in. The Internet users completely reject and disbelieve this explanation, and they strongly question whether evidence was being destroyed. Question 2: Why was the D301 engine taken away in the middle of the night? Late in the night of July 26, the remnants of the train (including the D301 train engine) were taken away for investigative purposes. Internet users disbelieve any investigation that is unsupervised and lacking in transparency. Question 3: When the passenger luggage and personal items are carelessly handled, how can civil rights be protected? During the entire rescue operation, passenger luggage and personal items were carelessly handled. The Ministry of Railroads has a maximum compensation amount of 2,000 yuan for passenger luggage. Internet users were unhappy about the casual attitude about private property. They also believe that the personal effects of deceased persons have irreplaceable meaning for their families. Rumor #1: The Ministry of Railroads dug a ditch to buy the train engine in order to cover up the truth. Because there were certain news photos about cranes and earthmovers working on the train, the Internet rumors spread about the Ministry of Railroads ordering the destruction of the train parts, burying everything in a big ditch and covering the truth. Although the media later clarified that the train parts were not being buried under, Internet users firmly believed in the "burial theory." The Yongwhen section of the Zhejiang province railroad resumed train traffic on the morning of July 25. But public opinion continued to focus on the safety of high speed railroads in China. International media questioned whether the Chinese technology contain flaws. At the time, there are 405 news reports, 332,992 BBS posts, 41,599 blog posts and 24,993 microblog posts about the safety of high speed railroads in China. The public questions causes such as the hastiness in completing the high speed rail links, the lack of training time for the train drivers/engineers, etc which eventually led to the incident. This previously lauded "safest high speed rail link in the world" became the target of scorn and sarcasm from Internet users. [microblog post] @YouthReference We do not oppose the development of high speed railroads, but we oppose the brash development of high speed railroads driven by considerations of interests. We want high speeds, but we don't want high speeds that come tainted with blood. It is a scary logic to tolerate safety problems in order to ensure development, even demanding people to tolerate and praise these sacrifices in the name of development. The latest public known data showed that the Ministry of Railroads has incurred debts totaling 2 trillion yuan. Internet users whether the Ministry of Railroads is in a deep debt crisis because they wanted to create the myth of high speed railroads. Question 3: The monopoly status in Chinese railroad industry. This incident has cast a huge shadow on the safety of Chinese railroads. This is on top of long-term problems such as the scarcity of train tickets during the Lunar New Year, the poor quality of services, etc. Internet users point to the Ministry of Railroads as the department least in touch with a market economy, most concentrated in market monopoly and rife with rampant corruption. Question 4: Multiple delays on high speed railroad trains. After the incident, there were still many other cases in which trains were delayed due to electrical power outages. Ever since the high speed railroads began operation, there have been many breakdowns. Some people even say that they refuse to take these high speed trains. Question 5: Foreign high speed trains are superior to the Chinese ones. The media and the Internet users praise the myth of the Japanese Shinkansen (New Main Line). They praise the safety records of the foreign high speed trains and they question the safety of the Chinese high speed trains. (6) Questions about the Ministry of Railroads itself. After the incident took place, the Ministry of Railroads was clearly inadequate in its investigations and rescue efforts. Public opinion targeted the Ministry of Railroads for corruption among senior managers, monopolistic practices, poor safety records, etc. At this time, there are 1,427 news reports, 519,997 BBS posts, 43,096 blog posts and 191,182 microblog posts about the questions related to the Ministry of Railroads. Internet users noted the Liu Zhijun (former Minister of Railroads) corruption case and the eight senior railroad managers who were busted for corruption this year. They wondered how much of the huge costs incurred in building the high speed railroads actually went into the pockets of corrupt railroad officials. As such, this latest incident was a "manmade disaster" created by systemic corruption over the long run. [microblog post] @Yan Haipeng in Shanghai: Liu Zhijun is in jail. But his crazy experiment is still continuing. The citizens of this country are his white mice. The several trillions of investment and the heavy debt load make it hard for his successor to change course. Li Zhijun wanted to use the high speed trains to ascend to become a Vice Premier. But he was derailed and so was his railroad. Our powers-that-be are all infected by the virus that is this kind of logic. At first, the Internet reported that the newly appointed Shanghai Railroads director An Lusheng had been previously dismissed because of his role in the Jiaoji Railroad major incident. It was later clarified that An Lusheng was only the Ministry of Railroad's chief dispatcher at the time and not the Railroads director held accountable for that incident. 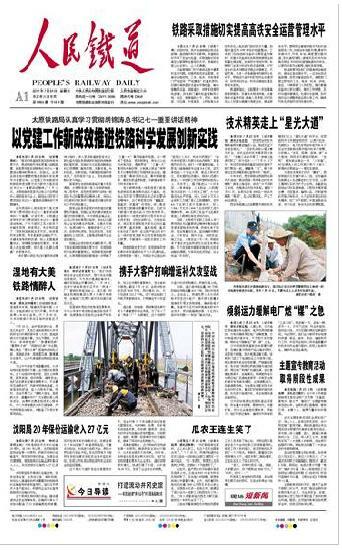 But there is another media report which said that An Lusheng had been the Shanghai Railroads director who tested and accepted the Jiaowen Rail Line on which the current incident occurred. If the investigation finds that the cause of this incident was due to engineering and/or equipment factors, An Lusheng will bear a heavy responsibility. In the 2008 Jiaoji Railroad incident, 72 persons died and 416 persons were injured. One of the survivors has still not received resolution on the compensation issue. After the compensation plan was proposed for the 7.23 incident, the Jiaoji Railroad case re-surfaced. Internet users accused the Ministry of Railroads of being unfair and hypocritical. "If they see that something is causing a stir, they rush out to calm things down; if they see that the matter is dying down, they ignore it." Question 4: The 21st Century Economic Report reporter discovered during the course of examining the documents of companies listed on stock exchanges that many of the senior managers (including outside board directors) of companies which have interests tied to the Ministry of Railroads had previously worked at the Ministry of Railroads. There are also interlocking connections between other companies related to these companies and the Ministry of Railroads' subsidiaries. Internet users are disgusted because this reflect what is happening with state-owned enterprises and Chinese society. Some people think that the result of any investigation and accountability effort will be necessarily untrustworthy due to the complicated interlocking ties within the railroad system in China. Question 5: Why was the Minister of Railroads interviewed inside an air-conditioned bus? On July 24, Minister of Railroads Cheng Guangzu was interviewed inside an air-conditioned bus which served as his command center. He was criticized for being "unserious and disrespectful". Question 7: On July 24, the Ministry of Railroads spokesperson Wang Yongping made a public apology at the press conference. Minister of Railroads Cheng Guangzu apologized only during a telephone conference call. No other senior leader from the Ministry of Railroads showed up to make any direct apologies. Internet users were not impressed. [microblog post] @Chen Jieren [Serious warning to Cheng Guangzu] You have made two major mistakes during this railroad incident. First, you transferred the person An Lusheng who was responsible for the Jiaoji Railroad incident to Shanghai. This is an insult to the intelligence of the people of China. Secondly, you refused to disclose the list of train passengers for the media to investigate. You should know that it is not up to you personally to decide whether to publish the list or not. This is duty that you must carry out. Your action has already shown that you are not an official who can be trusted. A former worker with one of the four major accounting firms exposed shocking secrets at the Tianya, MOP and other forums about the high speed train manufacturing factories. It was alleged that there were problems with the products as well as the technology itself. This caused Internet users to feel that the high speed trains are unsafe. Question 9: The absence of accountability in the incident and the indifference towards public skepticism. On July 24, the Shanghai Railroad director Long Jing, the Party Secretary Li Jia and the deputy director in charge of operations/electrical systems were relieved of their current duties and placed under investigation. The Ministry of Railroads did not conduct any further investigation. For example, there was an Internet rumor that the D3115 train driver/engineer said: "At the time, I said that I can cross over. I should have crossed over, but he made me stop." This 'he' ought to be a dispatcher who should be identified. Internet users examined the "lighting strike" theory and the "signal design flaw" theory and found them unbelievable. They want those persons who are responsible for the incident to be held accountable, but the official response has been sluggish and very disappointing. In the case of the 1998 Germany high speed train crash, the families of each victim received DM 30,000. Two government officials and one engineer were charged with manslaughter. The engineers were fined 10,000 euros each. Each year on June 21, the victims were commemorated. In the case of the 2005 JR Line incident in Japan, the investigation team spent about one month investigating the case and charged nine members of the operating company JR West Japan with "causing deaths/injuries as a result of operational mistakes." The company director and his senior staff members resigned. By comparison, the Ministry of Railroads immediately demolished the train engine and destroyed the scene of the incident immediately after the 7.23 incident took place, and no senior officials have stepped up to accept responsibility. Internet users are disgusted. On the night of July 24, the Ministry of Railroads called a press conference in Wenzhou. The Ministry of Railroads spokesperson Wang Yongping led the conference. At this time, there are 2,750 news reports and 258 videos. Internet users are very negative about this press conference and the behavior of the spokesperson. Question 1: Why did the spokesperson arrive late? Why was he laughing? Wang Yongping's performance was unsatisfactory. At the first press conference, Wang Yongping was 40 minutes late. He came and started the press conference with a hearty laugh. The reporters at the press conference posted onto the microblogs about his lateness. After the press conference, the photos of the "big laugh" was circulated on the microblogs. The Internet users were incensed at this arrogance and haughtiness. [microblog post] @China Youth Daily's Cao Lin: Someone wondered whether the photo of the laughing Ministry of Railroads spokesperson Wang Yongping was faked. I just watched the video of the press conference very carefully again, and it is true. The laughter occurred at around 14 seconds into the video. I have made a screen capture from the video. Question 2: Why were the contents of his sayings so "stunning"? Internet users found many "stunning" quotes during Wang Yongping's press conference. "In any case, I believe it": When a reporter asked a question about the train engine being buried at the scene, Wang Yongping replied: "The scene of the incident was surrounded by a mud pond. In order for the rescue equipment to get into the area, the earth had to be dug out. It was not to bury the train compartment. You can believe it or not. In any case, I believe it." "This is a miracle of life": Just as the rescue team at the scene announced that rescue operations had ceased because "there is no sign of life," they pulled a 32-month-old girl out of the wreckage at around 17:00. The Ministry of Railroads spokesperson Wang Yongping said, "This is a miracle of life. I can only say so. Such is the fact. It really happened." Internet users thought that these kinds of talk show an irresponsible attitude, an indifference to life and a contempt about the people's right to know. When the story of Wenzhou SWAT team captain Shao Yerong got reported, Internet users found out that "the miracle of life" occurred only because Captain Shao refused an order from a superior and this increased their dissatisfaction with the Ministry of Railroads. "In any case, I believe it" and "This is a miracle of life" have how become favorite Internet phrases used to tease the Ministry of Railroads and to express skepticism. There are entries in Baidu Encyclopedia and Baidu Knows. 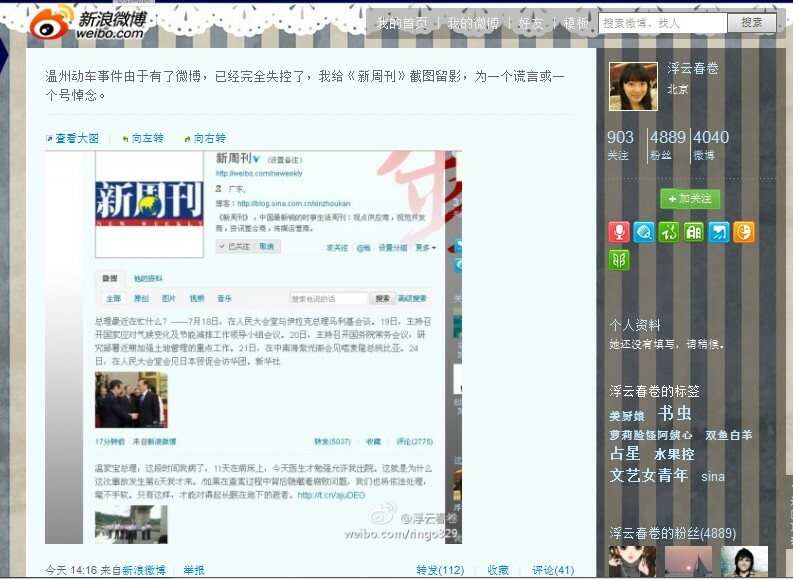 At this time, there are more than 1,600 news reports and more than 1.81 million microblog posts. A heavily forwarded microblog post goes: "If a nation is strong and prosperous, it won't fall even if everyone is allowed to own a gun; when a government is weak, real-name registration is required to purchase a kitchen knife; in a humane nation, the president will read out the names of the victims in commemoration; in a cold and indifferent nation, the number of casualties is a top state secret; in a free nation, reporters can question the cabinet members until they sweat bullets; in a confined system, the government official tells the reporters: You can believe it or not. In any case, I believe it." No doubt the major mainstream media are the most important channels for understanding the situation for most people. But after the 7.23 incident, the major media were evasive and elusive about their coverage. This drew questions and anger from Internet users. At this time, there are 40 news reports, 1,898 BBS posts, 967 blog posts and 15,748 microblog posts about the performance of the mainstream media. Public opinion believe that the mainstream media need to reflect on how to build an emergency response system to deal with natural disasters and other incidents, to provide accurate, truthful and objective information to the people and to raise the professional standards of the media workers. 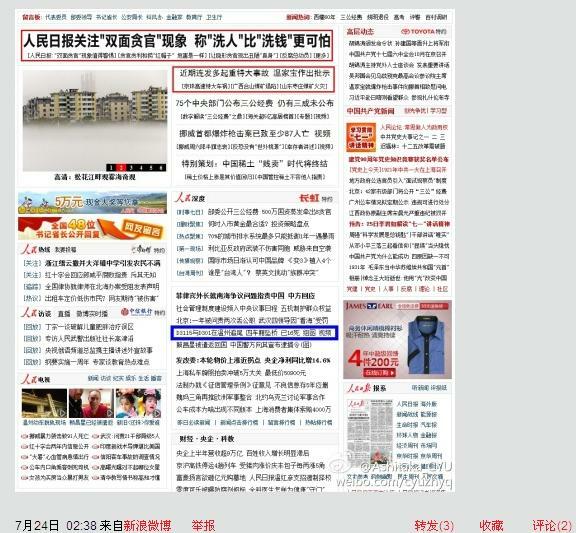 Question 1: On the morning of July 24, there was nothing on the front pages of People.cn and Xinhua. Early morning of July 24, more than 5 hours after the train crash took place, the two most important official websites -- Xinhua and People.com -- still did not carry any detailed reports about the incident. The incident was not put on the front page headline. People.com put its only report on the second screen. By comparison, the major Japanese mainstream media treated this as a front page headline story. CCTV began to report on this incident early in the morning, but they did not have detailed reporting on how the incident occurred and what happened afterwards. They spent most of the time praising the police, the firefighters and the medical workers. 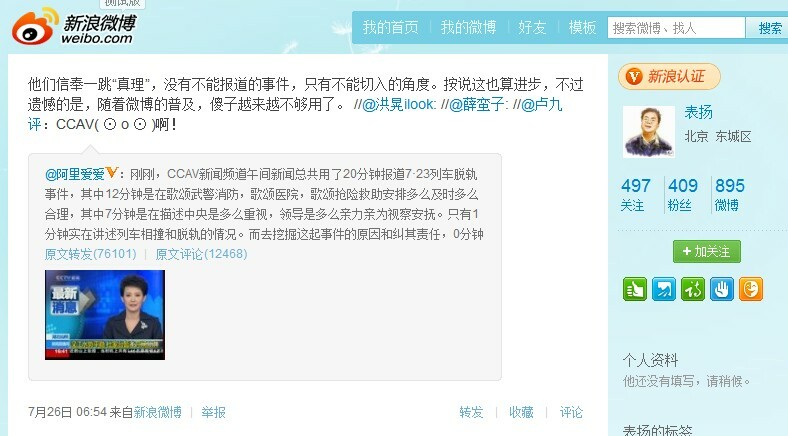 [microblog post] @Ali Aiai: CCTV's News Channel's Noon News used 20 minutes to report on the 7.23 train crash. 12 minutes were spent on praising the police and the firefighters, praising the hospitals, praising the appropriate measures taken to effect the rescue. Another 7 minutes were spent on describing how seriously the Central Government was treating the matter and how the leaders were visiting in person to offer condolences. There was only one minute was spent on describing how the trains collided and jumped off the track. Zero minutes was spent on determining the cause of the incident and the responsibility behind. Question 3: Why did the four major newspapers continue to refuse to cover the incident on the front page on July 24? What was the point of continuing to heap praises? 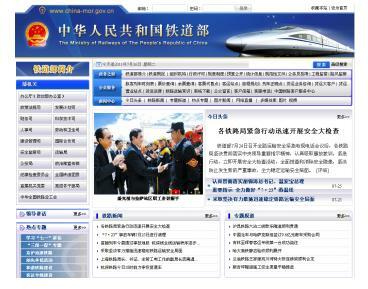 Why did the Ministry of Railroads' official website and <People's Railroads News> "lost their voices"? 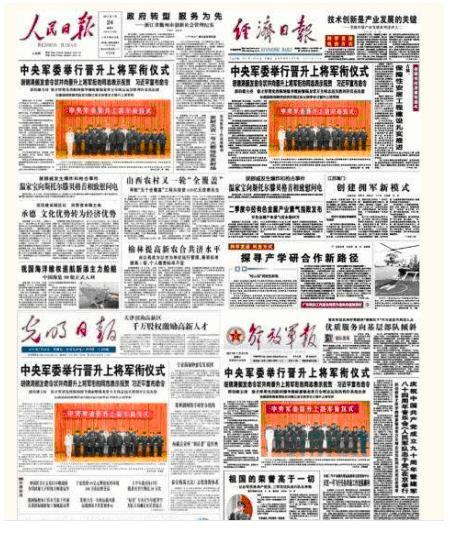 On July 24, <People's Daily>, <Economic Daily>, <Guangming Daily> and <Jiefang Daily> featured the same headline story of <Central Military Commission held ceremony for newly promoted generals>. The 7.23 incident did not made it onto the front pages until July 25. Even then, the reports were mostly in praise of the various departments that were involved in rescue efforts. By comparison, the Hong Kong morning newspapers and <Southern Metropolis Daily> emphasized objective descriptions and condemnations of the inadequate rescue effort. On July 24, the official Ministry of Railroads website and the newspaper <People's Railroad News> did not report on this major incident. As the party responsible behind this incident, the Ministry of Railroads "lost its voice" and thereby enraged the Internet users. In the relevant reports on July 25, the Ministry of Railroads used 11 keywords to praise themselves about the rescue effort. People were disgusted with their lack of self-reflection and sincerity. On the morning of July 28, the ailing Premier Wen Jiabao went to Wenzhou to visit injured passengers and to respond to media questions at the crash site. Many media outlets filed reports. As of 5pm that afternoon, there were 547 related news reports and 3,464 microblog posts. After this press conference, Internet opinion became warmer and steadier. The Internet users are grateful to the Premier for his concern, they look forward to his demands for the investigation to be fulfilled and they are worried about his health situation. Question 2: Why was CCTV not doing a live broadcast? Internet users pointed out that the CCTV News Channel should be making a live broadcast of the press conference. Instead, it was the Phoenix TV Information Channel and Hong Kong Cable News which made live broadcasts while CCTV was absent. Internet users were angry and perplexed. [microblog post] I can imagine and appreciate the anger felt by certain media workers at the CCTV News Channel who still have some sense of professional pride. At the crucial moment, you were hapless. So the only thing left for you to do is to use your conscience and professional dignity to work during those less crucial moments to move China closer to a civic society. If you keep doing it, there will come a day when you will not humiliated again at some other crucial moment. Question 3: Why did the Wenzhou reporter raise her question? During the Q&A process with Chinese and foreign reporters, the final question came from the reporter of <Wenzhou Daily>. Internet users debated the pros and cons of this action. Some Internet users believe that the people of Wenzhou showed admirable qualities during the rescue effort which should be mentioned during such a press conference. [Nanjing Morning News] Coming from a party organ, there is nothing unusual about the question from the female <Wenzhou Daily> reporter. But from the viewpoint of modern communication studies, this was a stupid question. The efforts by the people of Wenzhou were clearly visible to the media all around China and the Chinese people will remember them in their heart. There was no need for the Premier to point out and praise them. Let us hope that this press conference will change the way the Chinese media think about and pose questions! Question 4: If the Premier gave the initial order to save lives, why did the Ministry of Railroads demand to "restore train service as quickly as possible"? In response to a media question, Premier Wen Jiabao said that he called the Minister of Railroads and said: "Save lives." Earlier on July 28, the person in charge of the frontline rescue operations command center had said that there was no basis to support the media reports that "Ministry of Railroads officials said there were no signs of life and therefore rescue operations were stopped but a survivor was found later." Nevertheless, Internet users continued to ask why the Ministry of Railroads rashly stopped rescue operations and ordered train service to resume and why they failed to implement the Premier's demand. [microblog post] At Wenzhou press conference on the train crash, the CCTV reporter asked: Why did the scene get cleaned up so quickly after the incident? Wen Jiabao: "As soon as I got the news, I called the Minister of Railroads and I said two words: 'Save lives.' As long as there is even one sliver of hope, we should try one hundred times harder. The Ministry of Railroads will have to give the people an honest answer as to whether they accomplished this." Question 5: Was Premier Wen "allowed to travel" or "allowed to leave the hospital"? At the start of the press conference, Premier Wen said that he had been ill for eleven days and the doctors reluctantly allowed him to travel today. "This is the reason why I came here six days after the incident took place." But in the published text of his comments, Xinhua, Sina.com and other media mistook "allowed to travel" for "allowed to leave the hospital." Previously the media had reported that the Premier had met with the Japanese group to promote trade with China on July 24, thus causing certain Internet users and media to question the reason why the Premier did not come to Wenzhou earlier. The wording in the Xinhua and Sina.com reports have been updated since.